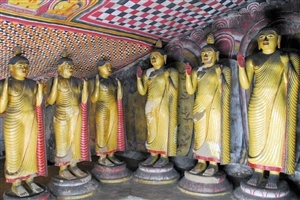 A fine nine day tour that encompasses both the old and new of Sri Lanka, with visits to the some of the main World Heritage Sites of the Cultural Triangle before time at a heavenly coastal getaway with sandy beaches and crystal blue waters – all in some of the most impressive accommodation that the island has to offer. 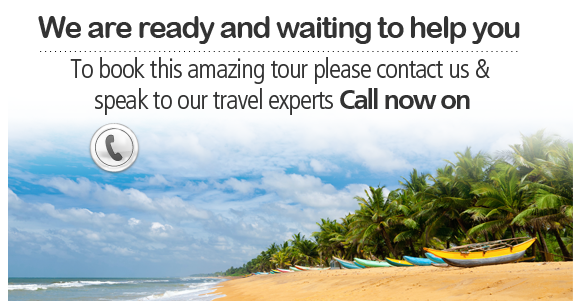 Arrive at Colombo International Airport to meet your guide and be transferred to your overnight accommodation in nearby Horathapola, stopping on the way to sample Sri Lanka’s sweet pineapples. You’ll spend the night in a grand plantation bungalow dating back to the early 1900s, which has been fully restored and which can found on a 50 acre coconut estate. After a morning relaxing on the estate, head towards the centre of the island towards the Cultural Triangle, with a visit to the ancient ruins of Yapahuwa, which was built in the same style as the rock fortress at Sigiriya. You’ll spend the night at the unique Ulagalla Resort, located in 58 acres of land and with a 150 year old mansion at its centre. Your exploration of the Cultural Triangle continues with a visit to the famous ancient ruins at Anuradhapura. Dating back thousands of years, the jungle city now features some of the most well-preserved ruins in the country, giving an insight into early Sri Lankan civilisation. 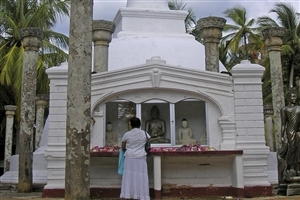 You’ll then visit the pilgrimage site at Mihintale, believed to be the place where Buddhist monk Mahinda and King Devanampiyatissa inaugurated the presence of Buddhism into the country. 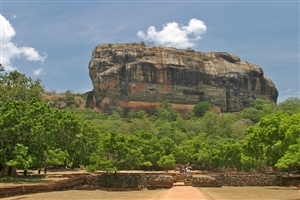 The day starts with a visit to another of Sri Lanka’s World Heritage Sites as you climb the 200 metres from the jungle floor to the top of the huge granite stone that forms the Sigiriya Rock Fortress; complete with the Heavenly Maidens rock art. Having admired ‘Lions Rock’ and the stunning views from the summit of the climb, there is the chance to take a ride on a bullock cart through the paddy fields around a Sri Lankan village before a catamaran ride to a traditional farm and onwards to meet a local family. 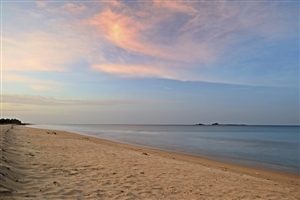 Head for the coast with a trip to the resort of Trincomalee, which is known for having some of the best beaches in Sri Lanka, with golden sands and crystal blue shallow waters. Spend two days at leisure enjoying your beachside location, with the chance to relax by the pool or on the beach itself. Depending on the season, you may be lucky enough to see whales swimming off the coast while you could also head out of the town to go snorkelling on the reef at Pigeon Island. 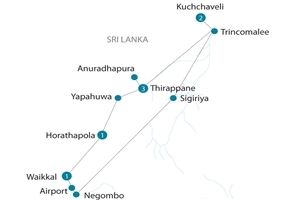 Journey across the country to the city of Negombo, where you can explore the wide array of shops and restaurants on the final full day of your trip. Head for the airport for your return flight home.